In chapter 12 of the book Green Urbanism, author Timothy Beatley examines examples of how economic success and environmental responsibility are woven together, resulting in a proverbial win-win for participating businesses and organizations. This discussion got me thinking about what may be the progression of the green building movement in the U.S. (and other countries) in the years to come. Though it is a bit outside our usual assignment parameters, I would like to share what I think could be the driving forces in our green economy in the upcoming years as well as where we are today. Much of this comes for an amalgamation of readings and discussions that have taken place to date in our Green Cities class. While Green and Sustainable have been concepts mulled over in universities and environmental organizations for years, even decades, these concepts have not been big in our nation’s workplaces. In fact, to some the go green movement spreading throughout our nation’s largest companies is seen as overdue, but to others, particularly the older generation that went through school without gaining sensitivity to environmental concerns, many of the environmentally thoughtful concepts we hear today in the Megabank commercials (for example) are relatively new. Every big company in America it seems must tout their greenness. The only problem is we are poorly equipped to assess these claims. When Megabank buys commercial time to tell us how they are improving the environment, they generally flash us a picture of a smiling ethnic female employee looking thoughtfully at a similarly happy child playing in a field, as though she cares deeply about that child’s future. Does she? And more importantly is the Megabank really doing all that much? I don’t really know, do you? However, I do speculate that this kind of advertising will likely not fly forever, and is only successful now because the general public is not sophisticated about what types of environmental strategies are truly meaningful and what others do little more than provide a basis for the company to scream that we are green, we care! Just like with your high school sweetie, we are in a period of infatuation, and yes it is beautiful, blah, blah, but it is temporary. 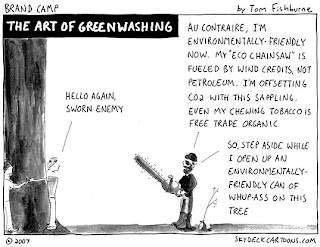 I dub this… the era of Greenwashing. So what pulls us out of this era? When possibly empty claims of environmental concern are no longer acceptable, what will take their place? It is here where the environmental standards play an important role. Programs like LEED and ECOPROFIT not only set concrete standards for environmental protection/stewardship/etc., they also bring recognition and legitimacy to the 99.98% of us that are not going to check Megabank’s environmental record upon hearing their assertions of greenness. For some, these standards have begun to take hold, and we observe that in many circles LEED certification is beginning to mean something meaningful. Among the general public this is not yet the case, but look for more standards to evolve and for organizations who want to put on a green face to gravitate towards these quantifiable standards. Enter the era of Accountability. As the push for green continues to race throughout corporate America, the need to quantify green programs will increase (after all, why should it be any different from anything else). Companies will want to understand the returns on their green efforts. Most likely companies will be more afraid of the perception that they could be seen as something other than green, and the costs associated with that. Green programs will become part of a company’s common business practices just as most major companies have become sensitive to and developed a policy on minority hiring (for example). Companies will determine an acceptable level of greenness based upon their competitors and upon the perceived benefit, derived mostly by public sentiment, of their programs. If my speculation is accurate, consumers will have done what they do best and shaped the direction and even the values of our nations industries. The power of the consumer can continue to evolve beyond that simply of one which dictates the way in which we want to look, or smell, or have our toast toasted. The power of the consumer can act much like the power of a voter and require our companies to uphold a higher environmental standard.